Stylish! And look at the competition suit below...not too aerodynamic for downhill racing in those days. That's my dad, Bill Ransom on the far right ready to leave for Sun Valley Idaho to film the Harriman Cup Race. 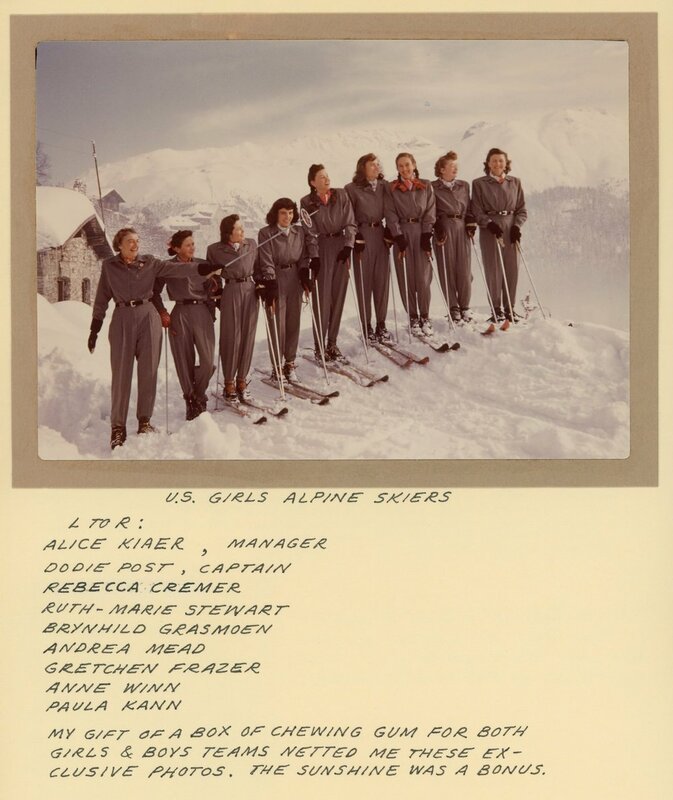 I have such fond memories of our family ski vacations. Dad loved teaching us to ski, and we had such fun together exploring new runs, making the first tracks in fresh snow, and warming my cold hands on Dad's warm coffee mug while he put his hands around mine. Dad was known for his many stories, and we heard the "Olympic Stories" over and over but I'm so, so thankful that he was happy to share his experiences, and he left me with his albums, and notes. Going through the albums I've learned even more, and find it fascinating. His phone call to Paul Helms got him started on the road to being a professional ski movie photographer and allowed him to travel to some amazing places, on someone else's dime. In 1950 Dad married Mom. He taught her to ski, handle a camera, and they worked together filming and editing their Olympic films. But that's another story.